According to Maggie Haberman of The New York Times, one reason Kirstjen Nielsen hung in so long as the head of the Department of Homeland Security is that “she was aware how awful life would/will be for her on the outside,” given her role in defending Donald Trump’s policies. That should be the case for anyone who has served, currently serving, or going to serve in the Trump White House. All these people should be treated like the guy who directed Billy Squier’s “Rock Me Tonight” video. Who the hell wants to work with that guy? Nielsen did not create Trump’s policy of separating migrant families, but she should be known forever as the person who carried it out. She separated families, put babies in cages, and lied to Congress that the policy didn’t exist. She should get the Aldo Raine treatment so she can be “ingloriously” identified with it for the rest of her life. Now, the inept Trump administration says it can take up to two years to identify thousands of separated migrant children. After John Kelly left his post as Chief of Staff, Nielsen was left without any allies in the White House. She was expected to be even tougher on the border, even if laws were violated. Apparently, that’s where she stood her ground and her enemies used it against her, from son-in-law Jared Kushner, Chief of Staff Mick Mulvaney, National Security Adviser John Bolton to White House Adviser Stephen Miller. The person who was least happy with Nielsen was Trump himself, who really loves the child separation policy. As legal experts challenge Trump’s authority to bypass a senior Homeland Security official in order to install a hand-picked acting head of the Cabinet agency that oversees immigration enforcement, it’s obvious the real director is Stephen Miller. Miller may also be behind Trump telling Border agents not to let anyone into the country to press for asylum, thus forcing them to enter the country illegally where they can arrest and detain them. Yesterday, a court ordered a halt to Trump’s “remain in Mexico” policy, which forces certain non-Mexican asylum seekers to wait in Mexico during their court proceedings. Trump and Baby Goebbels Miller are trying to create a situation for immigrants that’s worse in America than if they stayed home. While they are creating horrible conditions and hurdles for them, they can’t make it more discouraging than their homeland unless they start killing them. Let’s not give Baby Goebbels any ideas. Ron Vitiello’s nomination to permanently lead Immigration and Customs Enforcement was pulled after Trump remarked that “we want to go in a tougher direction.” Nielsen wasn’t tough enough for Trump even as she carried out his policy of separating families and throwing babies in Jail. All signs, such as Trump saying “America is full,” are showing a return to that policy and even tougher measures. Trump and Miller seek to make the United States a horrible place where nobody would dream of immigrating to. It’s becoming a place where many people dream of leaving. A seven-year-old Guatemalan girl died in the Custody of Border Patrol (CBP) last week. The Department of Homeland Security’s (DHS) statement has only raised more questions than it answers. The girl and her father were apprehended with a large group of migrants in a remote span of the New Mexico Desert. Reportedly, she hadn’t eaten or consumed water for several days. After being in the custody of CBP for over eight hours, she started having seizures. She was transported to an El Paso hospital where she died of dehydration and shock. Asked if food and water were given to the child, DHS only replied with blame for the father for taking his daughter on the journey to the United States through dangerous elements. She didn’t die on the journey. She died in Border Patrol custody. She died when she was their responsibility. CBP and DHS need to take responsibility. If someone’s life is in danger after they’re apprehended, saving their life should take precedent over detainment. The Trump administration needs to take responsibility too. White House spokesperson Hogan Gidley said the administration isn’t to blame for the child’s death. Gidley said, “Does the administration take responsibility for a parent taking a child on a trek through Mexico to get to this country? No.” He then heaped additional blame on Democrats saying, Congress should “pass some common-sense laws to disincentivize people from coming up from the border and encourage them to do it the right way, the legal way, then those types of deaths, those types of assaults, those types of rapes, the child smuggling, the human trafficking, that would all come to an end. And we hope Democrats join the president. While the U.S. government will only consider claims of asylum from migrants presenting themselves at ports of entry, the Trump administration has disincentivized them from doing so, forcing them to wait in Mexico for lengthy, indeterminate periods of time before considering their claims. Homeland Security Secretary Kirstjen Nielsen also avoided addressing concerns about how CBP treated the girl but instead characterized her death as “just a very sad example of the dangers of this journey.” Nielsen is a sad example of a cabinet member. The Guatemalan girl’s death comes months after a toddler died of an illness she developed at an Immigration and Border Customs Enforcement facility in Dilley, Texas. Aura Bogado, an immigration reporter with Reveal, sent a tweet detailing conditions in the “hieleras,” the Spanish word for “icebox” that detainees and guards alike use to describe CBP’s frigid holding cells. “Lack of accountability, and a culture of cruelty within CBP have exacerbated policies that lead to migrant deaths. In 2017, migrant deaths increased even as the number of border crossings dramatically decreased.” Pompa added. There is a culture of cruelty within CBP, as Border Patrol agents are known for pouring out water in the desert left for migrants by humanitarian groups. The conditions migrants are escaping from are so bad that Donald Trump’s threats and racist fear mongering isn’t discouraging them. People seeking asylum, at least those below our southern border, know they won’t be welcomed with open arms. Now, it seems they can’t be met with compassion or humanity. We’re the United States, and we’re supposed to be better than this. Before January 20, 2017, we were. Can we restrict people from entering this country if they’re annoying and self indulgent? Yes, we should prevent dangerous people from crossing our borders, but I think we should add selfie queens (that includes you dudes too) to the list. We have enough insecure people who were born here who can’t resist the urge to share their neuroses with the entire world, why invite more? And don’t get me started on cat pictures. Dog pictures are OK. In fact, being a dog lover should move people to the front of the line. News reveals that the Jihadist chick who was one of the terrorists in the San Bernardino shootings entered the country without having her social media checked out? What? I doubt you can get a decent job without someone from human resources checking out your Facebook and judging your cleavage and nights of drunken hootenannies. If Burger King wants to see your thong, then why shouldn’t DHS also take a peek? I don’t think we should stop people from coming to our country. That doesn’t mean they shouldn’t be vetted, or that the process we’re using now is perfect. Hell, the 19 hijackers responsible for 9/11 entered the country on visas. Everyone needs to be checked out whether they’re students or a fiance for a U.S. born loser who can’t get an American date and orders a bride from the Philippines. So why didn’t Homeland Security check out Tashfeen Malik’ s Facebook page? Sure, stereotyping is bad but she had been a resident of two nations, Pakistan and Saudi Arabia, where people are trained to hate the United States. Reportedly, she made several posts expressing a desire to join ISIL. Her posts were private and could only be seen by her most trusted Jihadists friends, but DHS should have checked it out anyway. 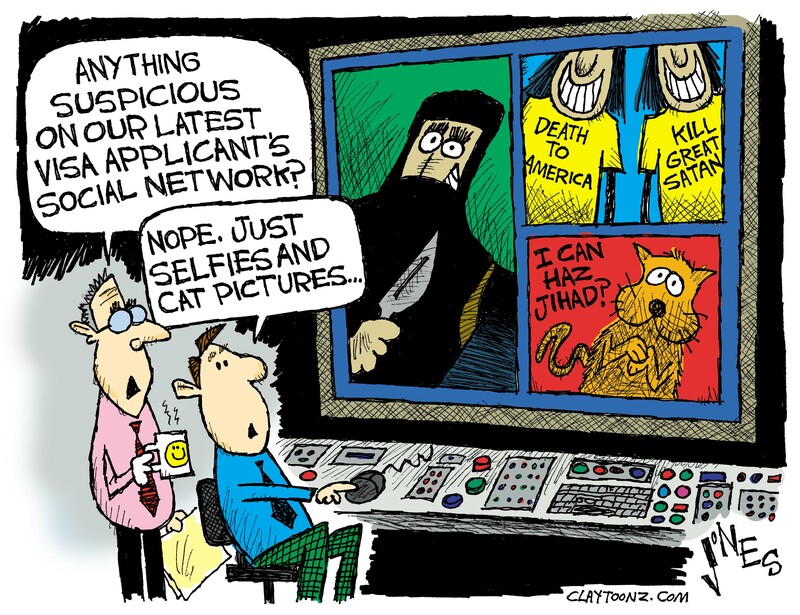 I’m sure the NSA is spying on U.S. citizen’s social media, so DHS could probably hack her Facebook and see whether she had a massive crush on Matthew McConaughey or Jihadi John. We need to know if her sugar daddy is Abu Bakr al Baghdadi. So yeah, check out social media. See if they hate America or just hate Nickelback. And if anyone from the National Security Agency is checking this out, please don’t put me on the No-Fly List for “I Can Have Jihad?”.